Great music score,great scenery,interesting camera angles,good atmosphere(especially during the showdown moments),good to decent acting and gun/sword fighting and awesome cinematography. 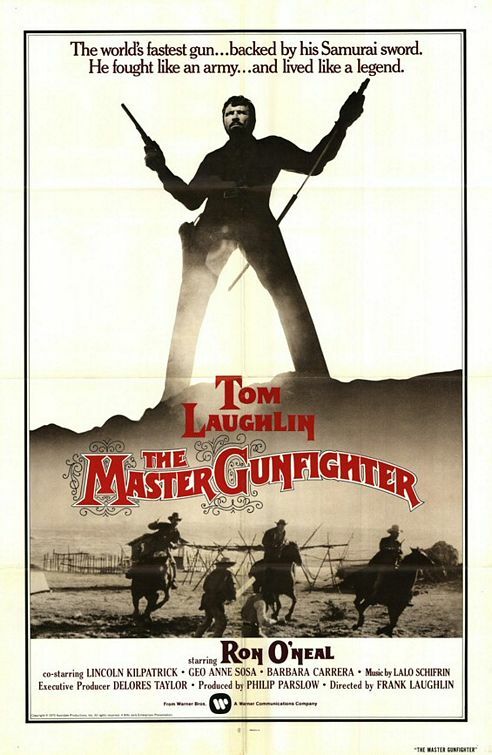 Whatelse can I say about the 'Master Gunfighter', it is a very entertaining Hybrid/Anti-western movie only Tom Laughlin and the crew could bring. Sure some of the movie elements could have been better like some of the editing (which wasn't that bad but could've been better) and some parts from the novelization of the movie should have been in the movie to explain some scenes better but all in all it is a really entertaining blend of Spaghetti western,samurai, and Tom Laughlin. The story revolves around Finely (Tom Laughlin, one of the coolest figures in motion picture history) a guilt tripped gunfighter and swordsman who witnessed a massacre of a peaceful coastal Native Americans by his brother-in-law and lifetime friend Don Paulo (Ron O'Neil, thats right Priest from 'Superfly') and his goons. Finely leaves but returns three years later when Paulo plains to do it again. This is where the gun play and samurai sword comes into play. Both Laughlin and O'Neil have a six chambered, double action pistol almost like a LeMot and a Samurai sword. A lot of critics and people complain about the peace through violence or redemption through revenge method but "To expect peace, prepare for war"-(Tom Jane,THE PUNISHER). Either that or they complained that it is too much like Billy Jack or not enough like Billy Jack, this movie was never meant to be a 'Billy Jack' movie. But I would suggest renting or borrowing the DVD, watch the movie and the special features to learn about the movie even more, it is actually quite interesting when I watch the interviews with the cast and crew. But if you are a western,samurai,Tom Laughlin, or just a 70s cinema fan then you should pretty much buy the movie. But everyone has their own opinions so I would say rent before buy. The story was adapted from an 1969 samurai flick called 'Goyokin' and this movie alone was only made on a budget 3.5 million of the Laughlins' own money and it is better than most movie with 10 times it budget. thanks alot for this movie, i've been wanting to watch this for a long time as it vanished from the screen in France a long time ago (french title 'el pistolero'),music by lalo schifrin and barbara carrera, evrything is done to make a good movie, thanks again!